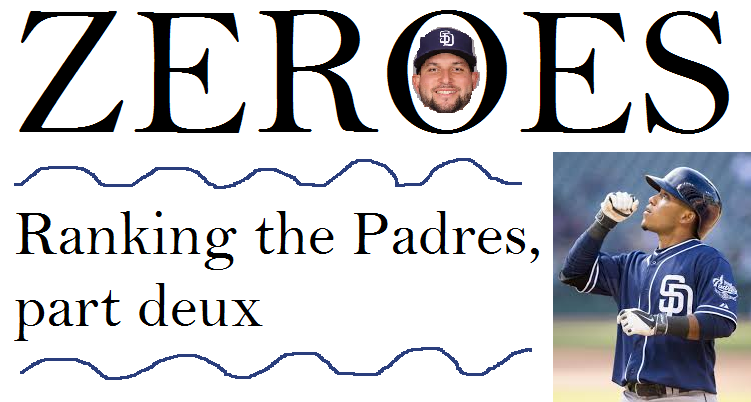 In the first part of the series, I covered the Padres who have negative value. To remind you, a negative value is only possible if the player is on a guaranteed contract that guarantees him more money than what his predicted playing performance dictates. Otherwise, a player can be cut without repercussion, meaning the player’s value is actually zero, not negative. Today, it’s time for the Padres with exactly (or negligibly close to) zero value. After this, we can finally start talking about Padres who are worth something. As a preface, zero values players have to be either arbitration-eligible (or very close) or earn precisely their worth while being negligibly close to replacement-level. These should be guys who have a realistic chance at clearing waivers. Now that he’s hitting arbitration and still hasn’t shown any glimpse of being a respectable first baseman for a winning club, I think his value has hit near-zero. The only thing that kept him above zero value was the fact that he was being paid basically league minimum, while not having quite enough time to definitively conclude that he was both a) injury-prone and b) replacement-level. With another injury-plagued season and even more lackluster “production” to his name, he’s safely in the zero value bucket. He could possibly add another position, rest up the wrist, and salvage his career as a passable bench player, which has value. For that reason, the Padres could he justified taking another look at him next Spring. The problem there, though, is that the Padres would have to be willing to accept the arbitration ruling, and the subsequent guaranteed contract for 2015. They may opt, wisely, to waive him and, if claimed, attempt to receive ANYTHING in return. Otherwise, with a perennially tight budget, they’re better off letting him leave to the claiming team and spending that minute savings elsewhere. I’ll put this as succinctly as possible, because I’m sure a lot of people will disagree. Alexi Amarista is arbitration-eligible, meaning he will no longer earn the league-minimum for his services; any chance of value here is greatly diminished. In other words: he has always sucked offensively, and he is managing to get worse. A utility player without an elite glove at any position, who cannot hit, and does not make league minimum is about as close to zero value as you can get. I’m not 100% sure he’d clear waivers, but I am fairly certain that it’s a waste of a roster spot to whoever would claim him. At any rate, his value is negligible or zero. He’s a free agent after this season, there’s no way anyone will give us anything for him this year, and he’s currently earning what he’s worth: just barely more than league-minimum. Most of his statistics show that he’s not quite replacement-level, but being Petco-aided and throwing completely meaningless innings means it’s hard to take a high-3 ERA (and FIP) as anything but below-average-but-not-awful. I think he’d get claimed if he was waived, but that no team would offer anything material in return. And the Padres would probably gladly save ~$0.5M over the remainder of the season while handing over those low leverage innings to minor leaguers they can benefit from seeing at the MLB level. Brooks Conrad, Jason Lane, Jeff Francouer…I’m looking at you, among others. YOU ALL MEAN NOTHING TO ME! But this should be obvious. It’s basically a tautology: these guys clear waivers with a salary that is already as low as it can be. They are, by definition, without value.